This charming instant download contains everything you need to give your projects that whimsical touch. 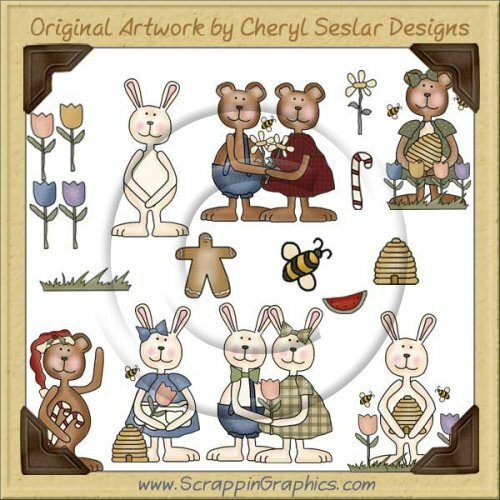 This set includes 22 individual graphics: Santa Claus bear, beekeeper bear, bear holding daisy, gardener bear, single bear, bear couple, bee, beehive, Santa Clause bunny, bunny couple, girl bunny bee keeper, boy bunny holding bee hive, single bunny, candy cane, daisy, gingerbread man, grass, watermelon slice, blue, pink, purple, and yellow tulip. 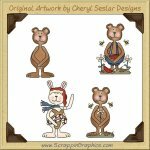 Adorable collection for creating seasonal scrapbook pages, invitations, cards and printables. These large 300 dpi graphics work well for your printing and crafting needs but can easily be reduced in size for use in web designs. The graphics come in high quality JPEG and transparent GIF formats.